Liverpool once again failed to pick up the full three points, as they endured a goalless draw against Everton in the Merseyside derby at Goodison Park last weekend. Liverpool boss Jurgen Klopp blamed the wind for his side's lacklustre display. 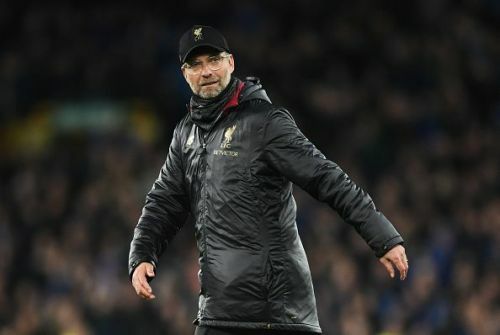 However, this was not the first time we got to hear such a comment from the German, as he had also blamed the wind for Liverpool's loss against Wolverhampton Wanderers FC in the FA Cup in January. Mohamed Salah has come under sharp scrutiny for missing the best chance of the game. With only the Everton goalkeeper Jordan Pickford to beat, the Egyptian failed to find the back of the net and claim the full three points for his side. Instead, the Reds dropped two points and are currently one point adrift of leaders Manchester City. Liverpool haven't bottled the league yet, as many people are claiming, but losing the lead for the first time after gameweek 16 is not a good sign. That's especially so considering Liverpool could have made it a 10-point difference by defeating West Ham United, Leicester City, and the Manchester teams. The difference in points is currently one point in Manchester City's favor. However, the advantage for Liverpool is that they are only participating in two races for two titles, while Manchester City are fighting for the Premier League, UEFA Champions League and the FA Cup. Liverpool's failure in the EFL Cup and FA Cup in their clashes with Chelsea and Wolverhampton Wanderers respectively showed no desire or will for them to claim the aforementioned titles. They seem to be aiming solely at the Premier League and the UEFA Champions League, and you can't really blame them for that. We might see a different scenario if Liverpool get out of the Champions League at the hands of Bayern Munich in the second leg of their Round of 16 tie. With only two games left against the 'big six' for Liverpool and both of them being at The Anfield, Liverpool might still spring a surprise by ending as the league winners.